My teaching partner, Devon, and I are trying to teach different words for emotions. It is 9:00 a.m. in Zambezi and I sit outside the convent on a cement surface near the white Land Cruiser that will soon take us to our first official day of teaching English at Chilena Primary School. This cement surface has become my favorite spot here at the convent because I am able to observe all that is happening outside the convent, while also hearing what is happening inside. As I rest on the cement surface, I can feel the warm Zambezi sun peaking through the large tree that creates some shade over the area but also leaves just enough space for the sun to hit my back to slowly air dry my freshly washed hair. There is a slight breeze, and it blows my skirt slightly as I reach to hold it down so my legs are not accidentally fully exposed. I add a few notes to my journal, and as I look up I see three local Zambian women, one carrying a baby on her back, and the other two carrying a plethora of woven baskets they had made. I approach the women as they walk closer toward me with a simple “Hello!” and ask “How many kwacha?” They point to different baskets to show each of their values. I ask the women how many hours it takes to make one of the baskets and she tells me “a full day if I sit to finish it all.” My mouth drops as I try to imagine myself focusing on something like this for a full day. I continue to look around at all the baskets for a few minutes, then I signal to the women that I will spread the word to the rest of the students in the convent. I walk into the convent, and the pace of my morning immediately changes. I join in on the usual morning jam sesh for a minute while the dish-washing crew for the day takes care of their task to share the news that we have some visitors, and a few of the students wander outside to check out the basket display. While I am still inside the convent, I hear Kris’s sweet motherly voice yell, “Okay, Ed team! Leaving in 5 minutes!” I grab the student journals, chalk, and eraser from my room and make my way back outside where I find the rest of my Education team waiting outside on my favorite cement surface. Kris comes out minutes later, signaling for us to load the cruiser. We hop in, and once settled in our seats look at each other with faces that display nerves, excitement, and curiosity all at once. Kris comforts us as we continue start the ten minute drive to Chilena Primary School, and we begin to share all the emotions we are feeling. During our drive to Chilena, locals wave at us as we pass and we wave back, feeling welcomed as usual. As we arrive at Chilena, we receive long stares from the students, some waving and some unsure how to react. We each hop out and begin to walk toward our seventh and eighth grade classrooms as we wave and hug the kids who greet us. Devon and I step inside our seventh grade classroom, and a group of about sixty students all stand up in unison as they say, “Goooood morning, Madame.” Devon and I smile and reply “Good morning, how are you?” The students reply again, “We are fine, and how are you, Madame?” This is the routine greeting we receive every morning. This form of respect is something I have never received at my age. It includes an element of trust that I do not feel I should receive, as I am just another “chindele” who has only known them for a few days. There are countless traits that the students at Chilena hold which I am so grateful to witness every day. One trait that continues to inspire me is their sincere love for learning. It is a difficult task to teach in English, but I have come to find it is even more challenging to speak and be taught in English. Despite this reality, the students at Chilena pay genuine attention to what Devon and I have to say, even when we feel like we may not be sending a message the right way to get a point across. The amount of attention the students give Devon and I as we stay attentive to our tone, speed, and clarity gives me the opportunity to be conscious of what I say and how I say it. Additionally, each individual student requires me to adjust my approach. Not only are the students at Chilena hungry to learn, but they are also creative. In my perspective of the American education system, a laptop, white board, and projector seem not only useful, but necessary in order for a student to continue advancing in the education system. The students at Chilena have quickly helped me realize this is the American consumer culture fooling my brain into thinking technology and knowledge are a necessary correlation. I have already learned so much from the students at Chilenga and it is an absolute joy to be able to learn from them every day. Chilenga offers a warm, welcome, and loving community and it is a blessing to be a part of it. 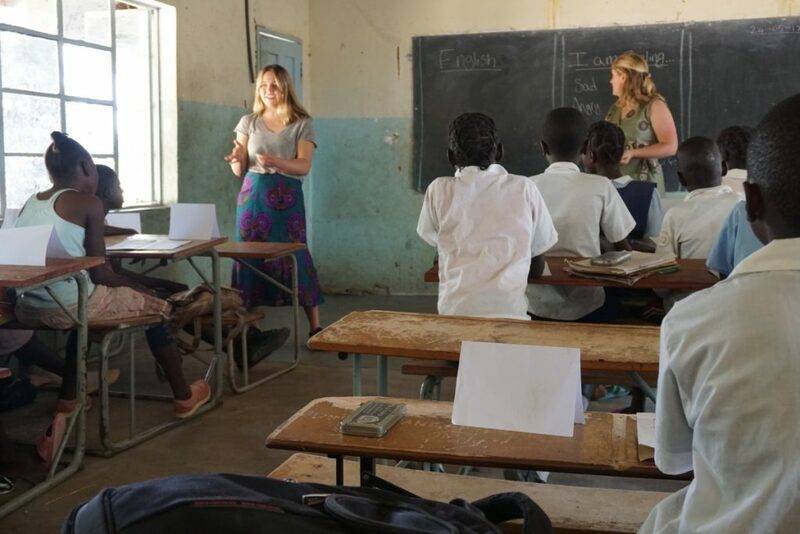 The people of Zambia and the students at Chilenga have helped me to slow down and think before I speak, a skill I hope to bring back home and continue to practice. P.S. hey fam bam, thank you for the sweet notes, I found them at just the right time and they helped me fall right to sleep! Big hugs and laughs when I get home! Oh Madelyn, your post came at just the right time! My morning routine since you’ve been in Zambia is to say my prayers and check the Gonzagainzambezi blog…I was so excited to see that today’s post was from you! Sixty students…that’s amazing! You and Devon look like naturals in front of your engaged class. Thank you for your descriptive writing and helping us to understand how your spending your time while away. We are so happy to hear you are doing well and enjoying the experiences your are being offered through Gonzaga. Keep teaching and loving those children❤️. What a great way to start the day, Mad! Just read this posting. My guess is that the smiles and great attitude from you, Devon and the Zag crew convey a universal language of love that transcends any language barrier issues . . . . Ahh, to be in that class, feel those warm smiles both directions, and know that Christ’s love is what brought you all there together. Must be awesome. . . I’m sure everyone is missing you guys, but, like us, super super proud of what you guys are doing there. PS LeBron went to the house in game 7 v Boston last night. Mission Beach bubble opened up and probably a dozen boats and couple of native nets out front. Whale went by. Your brothers were over for din din last night. Pretty much talked about you the whole time. Philly Boy thinks Rui gets picked up by Lakers after next season and LeBron maybe winds up there as well. C’mon, right!? Oh, and mom thinks it’ll work best if you and I drive to Hoopfest together. We can bump “Don’t Mind” and roll into town with style, girl! Oh Madelyn, your post came at just the right time. My morning routine since you’ve been in Zambia is to say my morning prayers and check the gonzagainzambia blog. I was so excited to see that today’s post was from you! Sixty students…that’s amazing! You and Devon look like naturals in front of your engaged class. Thank you for your descriptive writing and helping us to better understand how you are spending your time while away. We are so happy to hear you are enjoying the experience youu’ve been given by Gonzaga! Keep up the good teaching and loving those children! Love you so much mad! So awesome getting to hear these stories. We are thinking about you every day! Hello Mad and Fellow Zags! So lovely to see you smiling face in that photo! Your words are powerful and an incredible reminder of the simple beauty that is found everywhere in Zambezi, you brought back so many feels! Your suggestion that all we need to connect and learn from one another is an open mind and heart, is an excellent one. Thank you for sharing! Soak up each and every minute in that classroom and keep saying yes. Love you, girl. You continue to be a bright spot in this world and an inspiration as to how to live happy. You words brought me right back to the Summer of 1987. I had just graduated from Carroll and I got to spend 6 weeks in a convent in Mississippi with the Sisters of the Holy Names in their Mission summer school in Clarksdale and Jonestown. I taught 7th and 8th grade English. I learned so much that summer what kind of person I wanted to be and guess what, I learned that mostly by the examples my students set. Their hearts shone brightly with the blessings of the Holy Spirit. It’s an experience I will never forget and it continues to teach me life lessons. I know your time in Zambezi will yield similar blessings and lessons. Treasure your days there as those at home treasure you. You continue to be a bright spot in the world and an inspiration as to how to live happy! Your words took me right back to the summer of 1987 when I got to spend 6 weeks in the Sisters of the Holy Names, Mississippi Mission. I taught 7th and 8th grade English in their summer school program. I learned so much that summer about the person I wanted to be and the way I wanted to treat others. Guess who I learned it from? You bet it was my students! Their hearts brightly shone the blessings of the Holy Spirit. I carry those lessons forward to this day. Treasure all your days in Zambezi as I know those at home treasure seeing this experience through your’s and your classmates words. They are as lucky to have you as you are to have them! Stay strong Madelyn. Thank you for your post! I love your words – your story transported me right to the wall outside the convent, the Land Rover, the trip to the school as you entered the classroom. I felt the nerves, the respect but especially the love. What a blessing this experience must be for every single person being touched. Your energy and positivity radiates everything you do and I’m sure you fill those dusty classrooms at Chilena with the love that you so naturally and effortlessly share with the world. It’s a challenging classroom environment, but one filled with students who can truly inspire you with their enthusiasm for learning and their bountiful kindness. They can also remind you that Middle schooler are the same all over the world… a lil bit rambunctious, a lil bit angsty, a lil bit flirty, and a lotta bit awkward. Gotta love ’em though! I still think of them every day and I am so overjoyed at the image of you standing in that classroom with them! Keep up your wonderful work and keep sharing the gift of yourself with Zambezi! I was so excited to see your post pop up today!! I have been eagerly checking the blog every single day for any sign of my sista!! This picture of you teaching fills my heart with so much joy. It’s so clear that you are already making an impact in kids’ lives and i am so proud of you. Your words are beautifully written and I loved reading them all. I’m missing you tons in E-town but so so so happy that you are over in Africa leaving your mark on the world and learning lots. You make me so proud, pal!!! Expect lots of moby d and dragnet hangouts when you return. Enjoy the rest of your time there! I can’t wait to hug you (shocking right!!!!???) when you get back. Love you lots girly girl!!! I am so happy to hear from you on here and read the other posts from fellow Zags as well. Your writing is so descriptive and gave me a beautiful image and just a small taste/glimpse of life through your eyes in Africa. I am missing your light, laugh, and loving Madelyn nature over here back home, but speaking of home. I know that you make every place and space a home so I’m sure you will leave your loving nature to sprout a new home of love and growth over there in Zambezi teaching those kids. Keep up the good work and learning so much from the locals and from your peers and especially from yourself! Proud of you, miss ya and love ya lots. Soak in every moment and keep sharing your love. You are teaching with loving hearts, the students will learn plenty! Thank you for sharing your story. I am so happy to hear everything is going so well! You are on the journey of a lifetime that is for sure. You are so inspiring to me. That is such a big deal to be so far away from home and without any technology to phone home! I sure am missing my texts, snaps, and phone calls from you; but I will be so much more grateful for them when you get back. They truly are blessed to have you over there right now. I bet you’re the sweetest most amazing teacher ever. That is a whole lot of students, and I am sure every single one of them loves you! I hope you continue to soak up all the fun new experiences and come back safely and ready to have a dance party! I don’t know if you guys are able to download some of the new music out there, but there are some great new jams you gotta hear. Madelyn, I enjoyed your blog today! Your experience and emotions are sincere and honest. You brought me back to that first day in Haiti with patients and trying to communicate. Your eyes, your smile, your loving compassionate heart are being communicated to those students, as well as your words. Keep up the good work. May God continue to guide you, and the Gonzaga team, on this journey. Kudos, Madelyn, thanks for sharing. I’m reminded of an adage: “One who is unmotivated to learn cannot be helped. One who is motivated to learn cannot be stopped.” In my experience, we are at our best as teachers when we unleash and inspire the learning within others. I think there is no better path to this than mindful presence. I admire your embodiment of that principle. Madelyn. Your blog,touched me in a way that I can’t put into better words than your parents. I know for sure those kids are lucky to have you and the rest of the Zag Crew in their corner. Thank you so much for sharing your experience with the rest of us back home! It sounds like you have already learned so much within your first few weeks in Zambezi. I hope you cherish the remaining weeks in a place that so many Zags (myself included!) have come to love.